Let’s face it: at some point in your life, you’ve probably wanted a beard. And unless you’re the kind of guy who shaves in the morning, but already sports a 5 o’clock shadow by noon, it takes a lot of patience and determination to grow a full one. So when you do finally reach that stage of beard perfection, the last thing you want to deal with is incessant itching. Unfortunately, as any guy with a facial hair can attest to, beard dandruff or “beadruff” is real. Here’s how you can keep that beautiful beard nourished and flake-free. Dermatologist Dr. Kaycee Reyes of Luminisce Holistic Skin Innovations asserts that a common misconception of beard dandruff is that it’s caused by dry skin: “It’s not the sole reason, but dry skin can aggravate flaking by producing more oils.” According to Reyes, the main cause of beard dandruff, however, is an “imbalance of the normal skin flora or the proliferation of the malassezia species (yeast).” This is triggered by environmental factors like shampoo and conditioner residue, oil and balm irritation, abrupt change in temperature, and even stress, as well as hormonal factors. There are sebaceous glands in your skin that produce oils and secrete them into hair follicles as a form of lubrication. Men produce more androgen, which is responsible for hypersecretion of the sebaceous glands. Because beard dandruff isn’t a result of dry skin, unsurprisingly, moisturizer isn’t the magic cure. And Reyes reminds us that, as with anything else in life, there’s no one quick cure for beard dandruff. “It most certainly can happen again, especially if there are changes in the person’s environment.” Apparently, curing dandruff in your scruff takes longer than you might expect. Reyes says it could take four to eight weeks for you to see significant reduction in flaking. 1) Use shampoo that has ketoconazole, coal tar, or selenium sulphide on your beard. Let it sit for five minutes, and do this at least twice a week. 2) Apply anti-inflammatory steroid-based creams for only two weeks. 3) Or, you can try smearing miconazole/clotrimazole creams on the affected area twice a day, for seven days. 4) For hydration, use hyaluronic acid gel at least twice a day. 5) If your beard dandruff has gotten out of hand, take oral antifungal meds for at least two weeks. 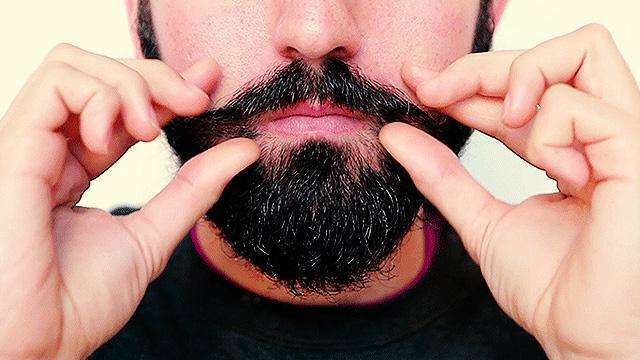 As an added bonus to your beard care routine, she recommends, “Gently exfoliating your beard with a konjac sponge at least twice a week, and rinsing with cold water.” Avoid scrubbing too aggressively. 1) It’s all about beard oil. Yes, they exist. Use it for two to three times a day, and if your dandruff is mild, it works quite well. Got a long beard? Comb the oil through to evenly distribute it. 2) Check the ingredients of your grooming products! We know people who’ve broken out in rashes just because they were using the wrong laundry detergent. Chemical sensitivity is real, folks. Opt for all-natural products if your skin is really sensitive. 3) Go for fragrance-free moisturizers.